Z-score calculator, formulas, solved example with step by step calculation to find the normalized, standard or relative standing value of a random variable of normal distribution, calculated from its population mean (μ). Generally it's a ratio of standard error to standard deviation of the normal distribution. Normalized score of a random variable is the distance between the random variable to the population mean (μ) of normal distribution, generally represented in standard deviation (σ). The required inputs of this z-score calculator are a random member, mean and standard deviation of population. In the process of normalizing, each member value of the population can generally use the mean & standard deviation of the entire population not the samples. However, in certain experiments, getting the complete population data is practically not possible where the sample standard deviation can be used to normalize the member values of a sample population. In statistical data analysis, Z-score also known as standard score, z-value, standardized score and normal score. The standard score transformation is useful to compare the relative standings between the members of the distribution with population mean & standard deviation. 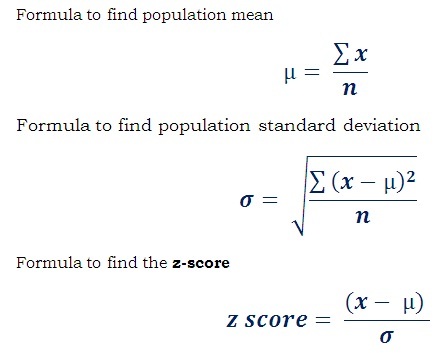 In other words, z-score determines how many standard deviations (σ) a raw score of a random variable of population above or below the population mean. Therefore, standard score is an important factor in probability & statistics to identify which random member in the normal distribution performing good, bad or moderate. The below mathematical formulas are used in the context of statistical data analysis to find population mean, standard deviation of a population (σ) and the z-score of a member from the population. The standard score is a signed number, therefore, the higher or lower z-value indicates how many standard deviations a random variable is above or below the mean (expected value) respectively. x is a random member from the distribution to be standardized. μ is an expected mean of population. σ is the standard deviation of an entire population. Follow these below steps to find the z-score of any member of normal distribution. The solved example illustrates how the values are being used in the calculation to normalize the data. 1. Find the mean of population. 2. Find the standard deviation of population. 3. Pick a random sample from the population. 4. Find the difference between the value of random variable and population mean. 5. Find the ratio between the difference and population standard deviation gives the normalized value of a member of that distribution. The below solved example for z-score calculation illustrates how the values are being used in the formulas to normalize the value of random member from the normal distribution. The class of five students scored 68, 75, 81, 87, and 90. Find the normalized or z-score of 75 for the population mean 80.2 and standard deviation 7.98? Step 4: Find the difference between the value of random variable and population mean. Step 5: Find the ratio between the difference and population standard deviation gives the normalized value of a member of that distribution. The standardized score (z-score) is important in the field of statistics data analysis to find the normalized score of an individual member in the normally distributed data. The manual calculations can be done by using the above formulas. However, when it comes to online to verify the results or to perform the such calculations, this z-score calculator makes your calculations simple as possible. The normalized score formulas, solved example problem along with step by step calculation may assist users to understand how the values are being used in such calculations.